Earlier this week, one of my cousins came to visit. He lives in Dusseldorf in Germany, and during the course of our conversation, we wandered onto the topic of living in the grand old continent, Europe. My European experience is fairly limited; I spent ten days in and around Berlin, traveling outwards to Prague, Vienna and Salzburg. During that period however, what really soaked into me was a sense of historical weight, the muted but still undeniably present sense of guilt and memory that was laced into every brass square I spotted on the pavements. Each one was a jolt, causing my stomach to drop just a little bit as the immediacy of the World Wars and their consequences was seared into me anew. I told my cousin that I couldn’t imagine living in a ‘place like that’, where tragedy seems such an inherent part of the city. Sure, Indian cities, especially places like Delhi, have seen more than their fair share of terrible happenings and years, but (for better or worse) those histories are not sanctified and made a part of the everyday in the manner that Berlin (at least) seemed to do for the Second World War and the Holocaust. Perhaps our tragedies are just so overridden by the struggle of making it through a day, with all that dirt and grime and the sheer volume of people and noise, that we don’t really notice it. Or perhaps, as long-term residents, we Indians have sort of immunized ourselves against the daily drama of human suffering that we see every day, and since we already have to shut so much of it out, our senses really cannot take any more in the form of self-flagellation over past sufferings. But I’m meandering now. What my cousins’s visit, and the conversation we had, really brought back to me was the European sojourn I had enjoyed, and I found myself, continue to find myself, thinking of Prague. Prague played host to me for two days and one night. My mother and I stayed in a little hotel walking distance from Wenceslas Square, one of the hubs of culture and business in the city. We walked around our part of the city, past old towers and museums and concert halls, took a bus to Prague Castle and St Vitus’ Cathedral, panted up the cathedral’s bell tower, saw the famous Astronomical Clock in the Old Town Square, visited a synagogue, cruised along the Vlatva and (my favourite part) visited Franz Kafka’s house. We also managed to watch a production of Swan Lake before boarding the midnight train to Vienna. Yes, it was all most wonderfully culturally enriching. I suppose it is natural for me to be fascinated by Prague. 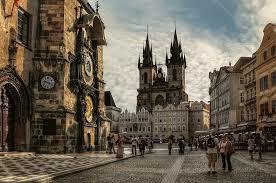 I’m a fantasy enthusiast, and Prague is so very rich in the mystical and magical. More than the surreal struggles recorded by Kafka in his work, what tugged at me was the layers of folktale that seemed to cast a mist over everything in the Old Town: tales of the golem, of ancient magics, of powerful words that could make and unmake life, all these secrets hidden away in narrow, stone-paved lanes and shuttered houses. Fantasy writers have of course celebrated these aspects of the city in their work, usually in connection with the legend of the golem, that animated clay-guardian of the Jewish quarter. Jonathan Stroud, for instance, in The Golem’s Eye (the second book of The Bartimaeus Trilogy)has a few chapters set in a slightly altered, but nonetheless recognizable Prague. The sinister, morbid magic of this bohemian capital brings out the melodrama in staid British gentlemen and plays host to life-draining, archaic magics that our hero, Nathanial, can barely comprehend. 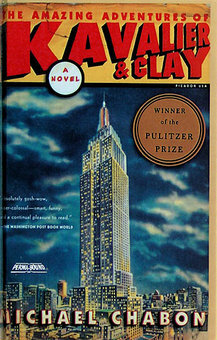 Another book that slips in and out of Prague (very quickly) is Michael Chabon’s The Amazing Adventures of Kavalier and Clay. Though this is not, strictly speaking, a fantasy book (it’s got very little ‘magic’ or otherworldly stuff happening), there is a portion— set in Prague—that gave me goosebumps. It’s right at the start, when Jakob Kavalier is smuggled out of the country in a golem’s coffin, with the golem inside. Jakob leaves Prague right before things become truly terrible for the city’s Jewish population, and when he next meets the golem, it has attained quite a different, and rather chilling, form. Both these books play on that one aspect of Prague: its dark, understated tone of magic, a kind that manifests itself not in flashes and sparkles and tight little spells (as ‘English’ magic seems to in Harry Potter), but one that came into being as a defensive force, built from the viscera of its people. Magic is in the cobbles of this city, flowing in broken currents down the Vlatva, embedded in the stones of St. Vitus’. That was the sense I got from my short visit, standing in the Old Town Square, or even in front of my little tucked-away hotel. Or perhaps that’s what I saw, since I expected it. Perhaps I just closed my eyes to the ‘mundane’ things: the showrooms, the cars, the people with lives not much different from me, walking to work and back. Instead of light and quick reads, I saw second hand bookstores stuffed with obscure texts written in Cyrillic script. Instead of work-exhausted office workers, I saw brooding café patrons who, no doubt, inspired Kafka. I think I usually see the world through a patina of literature, anyway, and Prague, being the kind of city it is, fit admirably into that frame. All said and done though, I stand by my statement: I couldn’t live there. Call me a coward, but that kind of magic, that sense of tragedy would do me in all too soon.